Acknowledging the significance and importance of the moment, after a chaotic day of ambushes, fighting and hot pursuit in the area of Eilat on Thursday — and some 48 hours of subsequent reprisal attacks on Gaza — Israeli Defense Minister Ehud Barak said Saturday that “Israel regrets the deaths of the three Egyptian policemen during the attack on the Israel-Egypt border”. 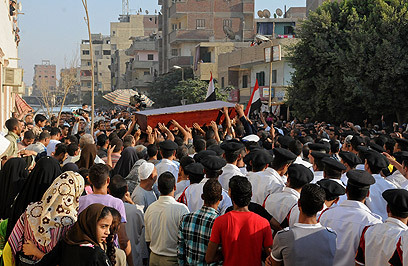 At least three Egyptian military personnel — Egyptian officials are more consistently now mentioning five — were reportedly killed by IDF soldiers in pursuit, apparently, of people they assumed were among the attackers. Haaretz said that “IDF soldiers fired across the Israel-Egypt border as they intercepted the terrorist cell behind the attacks near Eilat”. According to the report in Haaretz, published here, “Barak ordered the IDF to investigate the incident after which a joint investigation will be conducted with the Egyptian military to determine the circumstances of the incident”. Barak reportedly “expressed appreciation for the ‘discretion and responsibility’ shown by Egypt”. Barak Ravid wrote in Haaretz about Prime Minister Netanyahu’s testimony before Israel’s non-IDF commission of inquiry into the Flotilla fiasco that Netanyahu yesterday called a “maritime incident” that: “Prime Minister Benjamin Netanyahu seemed visibly unprepared for his public testimony before the Turkel Committee yesterday – hesitating over key details, evading questions and finally [later] publishing three statements clarifying and even denying what he had said just hours earlier … [The committee is headed by former Supreme Court justice Jacob Turkel.] But while his [Netanyahu’s] opening address, in which he enumerated Hamas’ crimes and Israel’s attempts to persuade the Turkish government to stop the flotilla, went smoothly, the subsequent questions – on issues such as the government’s decision-making process, Israel’s intelligence on the flotilla and Netanyahu’s personal responsibility for the incident – showed no evidence of these preparations. He refused to answer six questions entirely, saying he would do so only at a closed hearing. And he said he didn’t know the answers to many other questions – such as how much humanitarian aid was entering Gaza before the raid. But the Turkel Committee’s spokesman, Ofer Leffler, said Netanyahu did answer all six questions in his subsequent closed-door testimony, and had promised to respond in writing to those to which he did not know the answers yesterday”. The location has not yet been disclosed. The Jerusalem Post reported in the late morning that the meeting was at the King David Hotel in West Jerusalem. Other sources report that the meeting would be at 1:30 pm. A Hamas official criticized the meeting, saying it violated the refusal to hold direct talks. Palestinian sources later said that Fayyad would, in the meeting, demand that Barak should cancel deportation orders against four East Jerusalem Palestinian politicians who were elected on the Hamas-affiliated Change and Reform ticket to the now-dormant Palestine Legislative Council in January 2006 balloting. After the Hamas victory in that election, Israel arrested many of its affiliated members, preventing the PLC from having a quorum to vote. The PLC has not met in years — at least in the West Bank. Now, legal experts believe that the PLC four-year term has expired in January 2010. Nevertheless, Israel is proceeding with moves to effect the deportations — although this would violate one of the clear stipulations of the U.S.-backed Road Map. “[T]he meeting with the Secretary and Defense Minister Barak ran a little bit long. Let me start there. Minister Barak arrived and had a one-on-one with the Secretary for roughly 30 minutes and then broadened into a full bilateral with the respective teams. They reviewed the status of the ongoing proximity talks. There is a shared interest to try to move from proximity talks to direct negotiations as quickly as possible and discuss some of the ways in which we can build momentum to move towards those direct negotiations. The defense minister reviewed with the Secretary the decision that Israel made regarding its new policy towards Gaza. He reflected on the fact that even in the last couple of days we’ve already seen a significant expansion in the number of trucks moving into Gaza with more material for the people of Gaza, and he pledged that Israel will continue to expand that flow in the coming days and weeks. And then they talked about a wide range of other issues, other regional issues as well. QUESTION: Can we go back to the Secretary’s meeting with Defense Minister Barak? QUESTION: You said that he reviewed with her the new Israeli policy toward Gaza. MR. CROWLEY: Yes, he did. 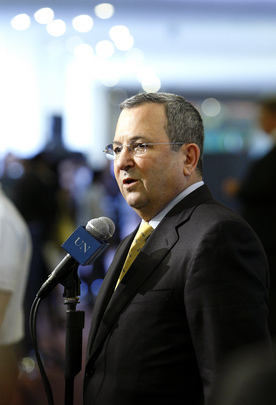 Earlier, the IDF spokespersons website reported that “On Monday (June 21), Defense Minister Ehud Barak spoke at the Socialist International Council at the United Nations Headquarters in New York, and explained that, ‘For Israel, the Gaza Strip today is an Iranian military base three kilometers from the closest Israeli city, and 60 kilometers from Tel Aviv. Hamas governs the Gaza Strip forcefully, and cruelly suppresses its political opponents … The ships that were organized throughout the last few weeks to ‘break the blockade’, are actually pure provocation, since there is no humanitarian crisis in the Gaza Strip’, he said, adding that “any organization wishing to send aid to Gazan civilians is welcome to do so through the Ashdod port: ‘Every day Israel provides, in addition to electricity and water, approximately 150 trucks loaded with equipment, and not only humanitarian aid products. Therefore, any international group or organization interested in sending additional aid, is welcome to do so through the Ashdod port, which in accordance with an agreement between Israel and the Palestinians, is also used for the needs of the Gaza Strip … [But] Israel cannot and will not permit free passage for ships delivering munitions to the Gaza coast. As long as a terrorist organization rules in the Gaza Strip, neither Israel nor Egypt will allow the entrance of those cargos. Israel has the right and the obligation to protect itself and it does so within the framework of International Law and the International Humanitarian Law’, he said”. This item is posted on the IDF Spokespersons website here. Michael Sfard, an Israeli human rights lawyer (described by Daniel Levy as Israel’s “pre-eminent human rights lawyer”, has written that Israel’s settlement freeze — now about half-way through the promised ten-month period — appears to be a “game” that may prove to be a bad deal for the peace process. Haaretz is reporting that “U.S. special envoy George Mitchell met with Defense Minister Ehud Barak on Friday morning, and was scheduled to hold separate talks with Prime Minister Benjamin Netanyahu and Palestinian Authority President Mahmoud Abbas later in the day … Secretary of State Hillary Clinton also spoke with Abbas on Thursday before Mitchell’s arrival in the region. State Department Spokesman Philip Crowley said on Thursday that extensive talks had been held with the Israelis and the Palestinians on concrete steps that both parties could take to improve the atmosphere, and that Mitchell would be continuing those talks … He said that talks had been held with the Israelis and the Palestinians since Mitchell’s last visit, including meetings with David Hale, Mitchell’s deputy, and Middle East policy adviser Dan Shapiro, and that with the conclusion of these talks Thursday, it was thought wise for Mitchell to go to the region”. This Haaretz report is published here. See our sister site Palestine-Mandate.com for some media analysis. The Israeli Air Force reports that it has attacked Gaza tonight, targetting what it said was a group of Palestinians launching rockets toward Israel. The IAF said that one person was killed, and four injured. There have been Israeli reports of sporadic firing from Gaza in recent weeks. Earlier today, Gaza’s former parish priest, Father Manuel Musallam, told me in an interview in his home in the West Bank town of Bir Zeit today, outside Ramallah, that he fears a renewed Israeli attack on Gaza. Father Musallam spent 14 years serving the Catholic Church in Gaza, and endured the unprecedented Israeli military attack last winter before being pulled out, by Church authorites, into what appears to have been a forced retirement last May, the day before the Pope arrived in the Holy Land. “I had written to the Pope to come to Gaza, to say NO to the suffering of Gaza, to the deaths and the injuries and the fear and the hunger and the thirst of the people of Gaza”. Father Musallam expressed indignation that in a report on the important events of the year 2009, the Church (here, apparently, headed by Patriarch Fouad Twal) said that the visit of the Pope was the most important event. “This was a big mistake”, said Father Musallem. “The Church neglected to say that the Church of Palestine suffered the war on Gaza — I was there, and I say that that was the most important fact of 2009”. The Jerusalem Post reported that “Prime Minister Binyamin Netanyahu was expected to meet with his top ministers on Wednesday evening, for the second time in one day, to discuss establishing a commission of inquiry to investigate IDF actions during Operation Cast Lead”. However, this is not being painted as a any kind of concession to those who have been calling on Israel to establish its own independent investigation. The JPost stated that “The commission would aim to curb a recent wave of calls to prosecute Israeli leaders and top IDF officials for alleged war crimes, after the release of the Goldstone Report, Army Radio reported. According to Israel Radio, senior Israeli officials said that as the Goldstone report is full of lies and distortions, Israel should probe how Richard Goldstone and the other members of the commission reached their conclusions”. 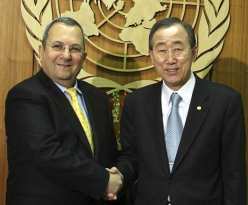 Barak with UNSG: Trying to derail Goldstone mission? How does Barak know that the Goldstone mission will “never be able to talk to [the] Gaza side”? Another very real question is: will they be able to talk to the Israeli side? Justice Goldstone and his team entered Gaza via Egypt through the Rafah crossing on Monday — because the Israeli government did not respond to the mission’s request for visas to come to Israel. They were greeted by Hamas official Ghazi Hamad, a former editor and journalist, and former adviser to Hamas’ deposed Prime Minister Ismail Haniyeh, who served as spokesman for the Palestinian Authority Government in 2006, after Hamas won Legislative Council elections, and who is sometimes described as a “moderate”. Hamad has written that Palestinians should stop “limiting our thinking” and has recently urged Palestinians to take into account the international community. He currently works in the Gaza crossings authority. Goldstone told journalists later that “We have come here to see, to learn, to talk to people in all walks of life; ordinary people, governmental people, administrative people”. Goldstone has interpreted this to mean that the mission will look at violations of human rights and international humanitarian law by all parties — including Hamas. “So far, Israel is refusing to cooperate”, said Rina Jabareen of Adalah, “and that means that the Goldstone mission wouldn’t have access to speak to the army, to the military and the political leaders”. Was Barak trying to bully the UNSG, in this meeting at UNHQ/NY, to go easy on Israel with this investigation, as Israeli media reports suggested yesterday afternoon? Barak, at least according to this report, notably did not discuss the Israeli sanctions against Gaza, which UN Security Council Resolution 1860 said should be modified to allow re-construction materials into Gaza after the very IDF Operation Cast Lead that the Goldstone mission is investigation. Nor did BAN mention this, apparently … At least, there was no statement to this effect issued by the UN spokespeople. UPDATE: At the regular noon briefing at UNHQ/NY on Tuesday [half a day after this post was posted], UN spokeswoman Michele Montas offered journalists this tidbit: “In response to questions I have been getting about the Secretary-General’s meeting with Israeli Defence Minister Ehud Barak, the two discussed the Board of Inquiry, the Gaza fact-finding mission led by Justice [Richard] Goldstone, access and movement issues relating to Gaza, the importance of the peace process, Lebanon, and the upcoming report on Security Council resolution 1701 (2006). On the Gaza fact-finding mission, the Secretary-General renewed his call for cooperation from Israel. The full briefing transcript can be consulted here. SECOND UPDATE: The next day — that is, at the regular noon briefing at UNHQ/NY on Wednesday 3 June — UN Spokeswoman Michele Montas announced: “I have been asked in recent days about the Secretary-General’s position concerning inquiries into what happened earlier this year in Gaza, and I wanted to make a few points clear. The Secretary-General has certainly not rejected the notion of an inquiry into the recent Gaza conflict. On the contrary, and apart from the Board of Inquiry that he had instituted into the damages against the UN, he has both privately and publicly supported the Human Rights Council’s fact-finding mission. He has also counselled and urged the Israeli Government to cooperate with this inquiry. Indeed, he last did so yesterday at his meeting with the Israeli Deputy Prime Minister. It is precisely because such an inquiry exists that the Secretary-General did not contemplate establishing another commission to undertake the very same task. The Secretary-General is conscious of the fact that the Human Rights Council is especially well placed to commission an investigation into whether breaches of international humanitarian law have taken place, and had done so, inter alia, by selecting respected jurists to undertake this task, and had revised their terms of reference to ensure a balanced approach”. The full transcript is published here. “Question: The Palestinian situation … continues to be dire. Has the Secretary-General spoken to anybody in the Israeli authorities now to loosen up the border crossings and things like that? Spokesperson: Well, you know that he has been doing so extensively, actually. He met Israeli officials twice during the week, as we mentioned in the readouts, every time it was [discussed] … You know, nothing has changed in terms of the actual access. As you know, we talked about construction material, we talked about the fact that there was no way we could help reconstruct Gaza if none of the material was allowed in. Yes, Talat. Question: Michele, the [inaudible] spoke with us last week from the region and said that there were 630 blockades [n.b., he must mean roadblocks and/or checkpoints] and that they were primarily being set up to protect Israeli settlements. Was there any statement or follow-up from the Secretary-General on that comment? He also had said that senior advisers on behalf of the Israeli side were speaking with UN officials about bringing down some of those blockades. Is that…? Spokesperson: We have been talking about this for a long time now. Those blockades are not new, as you know, and they have been hampering the free circulation of people, and we have been talking about them since the Secretary-General has been Secretary-General. He has been talking about those restrictions to free movement … We have been following up, as I said, on a regular basis on this. Question: So there is cohesive agreement that the blockades are being set up primarily to protect Israeli settlements? Spokesperson: Well, this is something for the Israeli Government to say. They’re the ones setting up the blockades. It’s not for us to say. What we are saying, what we have been protesting, is the fact that there are so many of them and it makes the life of Palestinians increasingly difficult. That we have been saying over and over again. Question: Michèle, just a follow-up on that topic? Spokesperson: I can try to get more details on what they mean. Spokesperson: Well, we have been coming out very strongly against the settlements ourselves. As you know, the UN has been very vocal about that, saying that these go against previous agreements and that they should not build any new settlements. Question: Sure, but I mean, the Secretary-General has been urging the Israelis for over a year now to alleviate the blockade of Gazans and there has been nothing in response. Is he looking that this is a moment of opportunity to kind of elevate his pressure to try and…? Spokesperson: Well, his pressure continues, you know. It was the case when he met two high Israeli officials this week and all these were expressed during those meetings. Spokesperson: I don’t think there’s any disconnect. Each group or each side just flagged their own concerns and that’s the way it went. That doesn’t mean that one accepted the point of view of the other one … Yes, Mr. Abbadi. Question: Also on the Middle East, Michèle. The United Nations is a part and parcel of the Quartet. Are there any preparations towards holding a meeting of the Quartet on the Middle East at this stage? Spokesperson: Well, I think there are discussions about the next meeting and I’ll let you know when it happens”. This briefing transcript is available here. YNet also reported that “Barak will stay in New York today to meet with the US special envoy to the Middle East, George Mitchell. On Tuesday he will arrive in Washington for a series of meetings with administration officials, including Defense Secretary Robert Gates and National Security Advisor James Jones”. This YNet report can be read in full here. Posted on 2 June 2009 Author Marian HoukCategories BAN Ki-Moon, Gaza, Human Rights, Humanitarian Aid, International Humanitarian Law, International Law, Israel, Palestine & Palestinians, UN Secretary-GeneralTags Adalah, blockade, Gaza, General James Jones, George Mitchell, IDF Operation Cast Lead, Israeli Defense Minister Ehud Barak, Justice Richard Goldstone, Rina Rosenberg Jabareen, Sanctions, UN Secretary-General BAN Ki-MoonLeave a comment on Barak with UNSG: Trying to derail Goldstone mission?